How Did We Do On 2015 Tech Predictions? 'Still Waiting' : All Tech Considered Last year, our tech reporters looked ahead to developments dealing with anticipatory computing, data breaches and Apple. Now as 2015 ends, they consider what has changed. The Echo, a digital assistant that can be set up in a home or office, vaulted into the top 10 of Amazon's best-selling electronics this year. Aarti, Laura Sydell and Elise Hu had a similar conversation as 2014 came to a close, forecasting a few themes they expected to spill into 2015. Now, as 2015 is wrapping up — how did they do? This year we saw Amazon Echo — a digital personal assistant powered by artificial intelligence — become a hot buy during the holiday season. It's vaulted into the Top 10 of Amazon's best-selling electronics, sure. 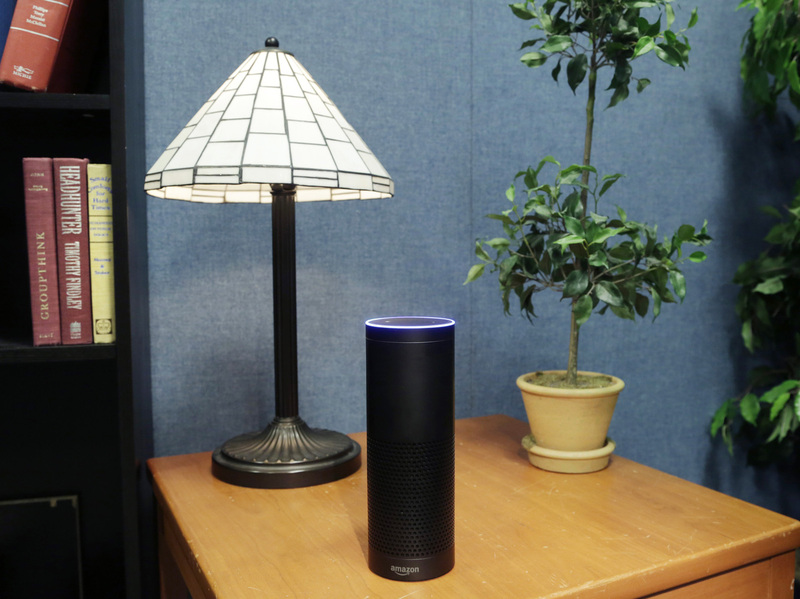 But the behavior of using your voice to boss around inanimate objects (in Echo's case, a cylindrical speaker, but in Siri's or Cortana's case, a smartphone), and then relying on that object to use the wealth of data you've shared with it to anticipate your needs, still isn't as common as I expected it'd be. "The more we add apps and digital functions we need to perform on our devices, the more individually tapping or typing for each function becomes a hassle.
" 'As we become more digital, as we use more things in the digital realm, we just need time to manage all that. And it is not feasible with the current manual processes. So the machines will learn our behavior, how we do certain things and start anticipating our needs,' Malik says." Anticipatory computing became more of a thing in 2015. But it still hasn't become mainstream. After all the news of hacks in prior years, you'd think that 2015 would provide respite, but that's not what happened. We had numerous health care data breaches. Anthem, the health insurer, was breached, with roughly one-third of Americans' personal data stolen. Excellus BlueCross BlueShield and UCLA Health, in California, were also health industry targets. In the government, there was the IRS breach and of course the Office of Personnel Management. In the case of OPM, files on 22 million individuals were taken — everything from home addresses to very personal disclosures (stuff that can be used to blackmail). Consumer hacks included the toymaker VTech, in which data on millions of kids was taken. Also the Ashley Madison hack, which exposed the information of millions of users of the adultery site (remember, not every user listing was correct!). The best expert we could find — one recommended by federal authorities — estimates hackers have taken 60 to 80 percent of American Social Security numbers. In many of these breaches, the data was not encrypted, which is bonkers. We're in 2015 and it seems like encryption should be a norm. But it's not — and arguably the penalties for companies just aren't high enough to force them to clean up their acts. Laura's 2014-2015 Idea: Apple Inc.
Last year at this time I commented on how well Apple's stock had done after its record sales of the iPhone 6. The stock has now declined from April's high of more than $134 per share to below $110. Apple continues to have record sales of its iPhone under CEO Tim Cook. So why is Wall Street so gloomy? Apple has not released any official sales numbers of its watch, prompting some speculation that it hasn't done that well. Research firms like IDC say next year, the smartwatch market will grow significantly and Apple will lead the way. If that proves true, it wouldn't be the first time that Apple defied naysayers, who also pooh-poohed the iPod, the iPhone and the iPad. But this time, Steve Jobs isn't around — will Cook have the mojo to pull off the watch? The jury is still out, but I do predict that in 2016 we will finally see if the Apple Watch has been a success. The story isn't much different with Apple Pay. So far, the mobile payment system doesn't seem to be widely adopted, though, again, Apple isn't sharing a lot of information about it. According to a report by Infoscout, use of Apple Pay declined this shopping season. But Apple also just made a deal to get Apple Pay into China, where people don't have a long-entrenched habit of using credit cards. That and the fact that more retailers are accepting Apple Pay may lead to a turnaround this year. So where are we in regards to what I said a year ago? Sadly, still waiting.